I don’t know about you, but I go through these awful, restless phases where I find it difficult to even do and enjoy the stuff I love. Sometimes it’s just me being a dumb poop, and sometimes it’s because of other things going on in my life. Sometimes it doesn’t bother me, depending on what the thing is; like, with video games it doesn’t bother me because I generally don’t feel productive when I play video games, as much as I love them. So, if I go through a phase where I just can’t sit still long enough to spend an hour or two beating in zombie faces, then I’m not gonna be too mad about it. But then there are some things that I feel are VITAL to my entire existence and when I go through phases in which these things don’t come easily to me, I go balls-to-the-wall, flat out crazy. When I lose my knitting and crochet mojo, I’m basically a miserable shell of a human, and I just managed to break a spell where I knitted maybe twice in four or five weeks, and those two times were pathetic so they basically don’t count. Prior to my crafty dry spell, I had started the Copenhagen Hat by Rachel Brown because a) I was legit actual obsessed with it and wanted to make it NAO, and b) I really wanted to tackle some fair isle and show it that it’s not the boss of me. I figured this hat would be the perfect way to jump in – two colors, traditional star pattern, nothing too small and fiddly so I have plenty of space to manage my tension. And, bonus, I could learn an i-cord cast-on while I was at it. YES. WINNING TIMES. And then, my mojo decided to forsake me. I’d gotten my i-cord cast-on finished – which took me FOREVER, but, I had made steady progress – and then… it just kind of stopped. What you see in the picture above is where it had stayed for weeks. I was completely beside myself. Now, I don’t want y’all to think I’m some unhinged crazy person (I’m not saying you’d be wrong to think that, I just don’t want you too… hard truths), but just thinking about my non-knitting made me cross and depressed and there were a few times where I honestly felt like I was going to have some kind of stampy-tantrum/panic attack because I had this fantastic pattern, some beautiful squishy yarn (Misti Alpaca Tonos Worsted from my fave SunSpun, FYI) and I just couldn’t get things going! I was totally off my face with frustration! Finally, I decided I had to stop forcing it, and get all zen up in there and just let it happen when it was ready to happen. I kept my knitting with me – just in case – but I didn’t pressure myself to work on it. 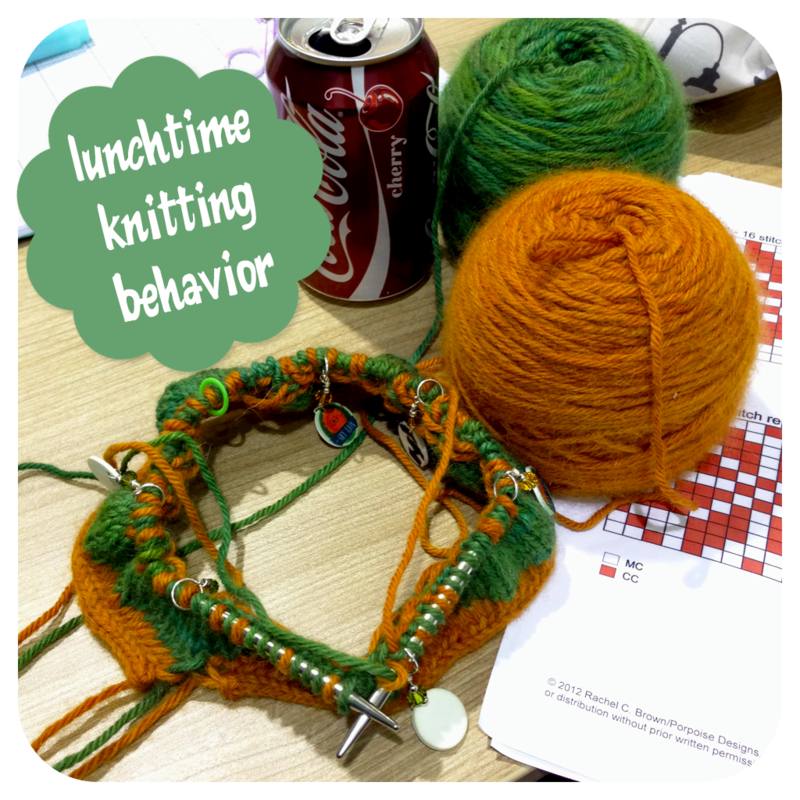 I tried to just be calm, I tried to not to take stress from work home with me, I tried spending time doing other things – video games, reading, tidying – and decided that when my knitting mojo was ready to come back to me, it would. Finally, slowly but surely, my yarnie mojo started showing itself in dribs and drabs. My friend Sammy and I have what we call “Anti-Social Lunches” where we’ll have lunch together and read our books. Well, one time I ended up knitting instead of reading. At the Morris & Sons SnBs, I would spend more time eating candy and admiring other people’s work, but I would get some rows done in between Jaffa Cakes. And then before I knew it, at the end of Sunday evening, I found a finished Copenhagen Hat in my lap and I hardly knew what to do with myself! I was so happy! Is it the best knitting I’ve done? Nope. There are plenty of uneven bits, but hey, I’d never done fair isle before, and I think blocking will fix most of ’em. 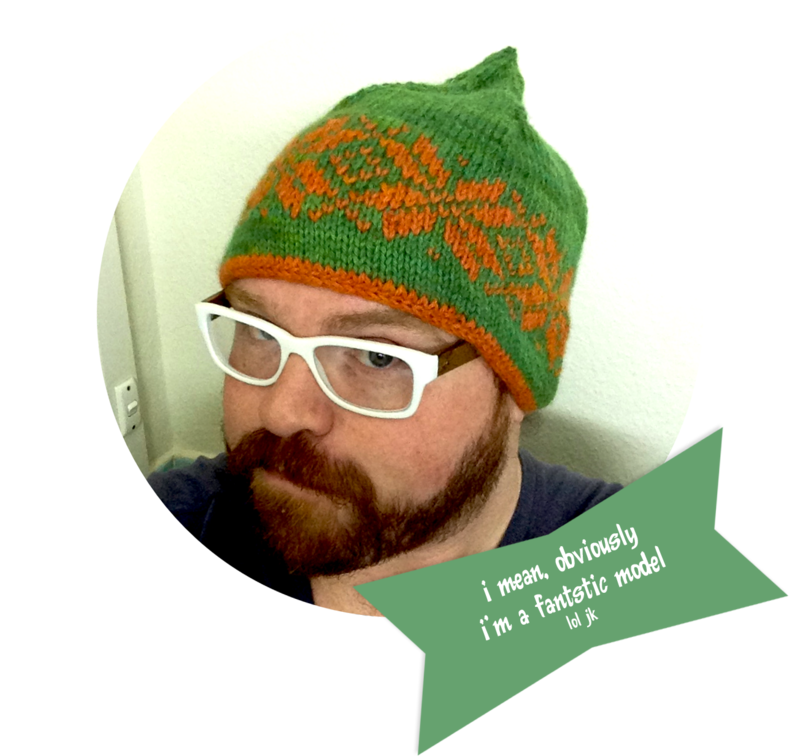 My knitting mojo may not be firmly back under my control – I still haven’t chosen my next project unlike my usual compulsive “CAST ON ALL THE THINGS!” – but, and it sounds totes dorky, this hat saw me through a kind of stressful and frustrating patch. It was like a little external reflection of what was going on inside my head. Do you ever find yourself in creative ruts? How do you get your crafty mojo back? Sharezies! I’m glad you got your mojo back! You know, I find I have to knit something every single day… even if it’s just one row of my jumper. I do find that I usually have 2 or 3 projects on the go, and sometimes when you get stuck on one it’s nice to be able to leave it for a while and work on something else. I also love the Christmas ball knitalong this year because you can finish an entire project in a weekend which is great motivation. ps: Your fair isle hat is fab. Ahh I know how that feels! What was the longest you’ve gone without doing it? P.S. I’ve never heard of i-cord cast on before, it looks awesome! Totes need to research this!